The first time I became acquainted with mental_floss magazine, it was catching brief glimpses of the bi-monthly American periodical being flipped through at Central Perk by Courtney Cox- Arquette on NBC's Friends. While product placements are nothing new-- instead of Cosmopolitan or In Touch-- it was amazing to see an actress actually insert her own prop into the show (as she and husband David Arquette confessed to being fans in an Entertainment Weekly interview years ago) and far more impressive that the prop in question was the witty and infinitely wise mental_floss. 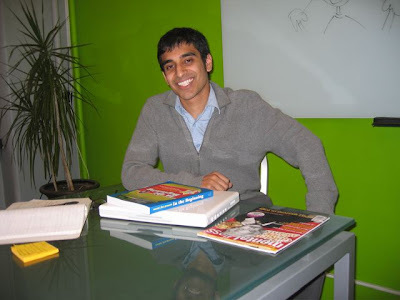 With a tagline encouraging readers to "Feel Smart Again," creators William E. Pearson and Mangesh Hattikudur conceived the idea over a meal shared in the Duke University cafeteria, upon realizing "the need for an educational magazine that was funny and entertaining." While the president of the university disliked the name, he was impressed enough to allow the two ambitious writers a chance to publish the magazine in its earliest form, when it was known as the "Campus Edition." 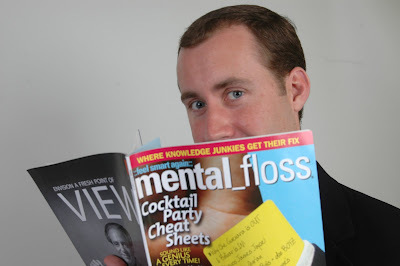 Officially, the mental_floss that readers and subscribers would come to know and love first officially hit the market at its home-base in Birmingham, Alabama with its 2001 launch. Amazingly, the first issue (pictured below) caused such a stir that "8,000 copies were distributed, and 60% sold out on newsstands." From then on, it just continually grew stronger appealing to those, like me, who have an insatiable appetite for knowledge. Presenting the wildest facts penned in the wittiest of ways, blending together pop culture and history so that it's reader friendly first and foremost, the "edutainment" magazine proved to be illusive to buyers as more and more stores ran out of copies quickly after it hit shelves. And the magazine it seemed was just the beginning as the editors and writers moved onto share their knowledge in a number of books, a board game, and a series that includes such titles as Law School in a Box and Med School in a Box. And on Tuesday, October 28th, their latest book will hit the shelves from the good folks at Harper Collins. Aptly named The Mental Floss History of the World: An Irreverent Romp Through Civilization's Best Bits, authors Erik Sass and Steve Wiegand along with Will Pearson and Mangesh Hattikudur condense 60,000 years of human civilization in twelve chapters. Breaking everything down into timelines, each section opens with what happened "In a Nutshell" as well as a timeline and some of the subheadings like "Spinning the Globe" are taken right from the magazine itself, making it an easy transition for devotees of mental_floss to their latest opus. A far cry from college textbooks, History uses pop culture references such as "Who's Your Daddy? (The Founding Fathers in Four Minutes)" to titles like "Lenin and Trotsky and Stalin Walk Into a Bar...," "Name that War"and perpetually ranks "who's up" and "who's down" at any given moment. Also, amusingly the authors season the book with strange quotes like Ronald Regan's assertion that "trees cause more pollution than automobiles do." While there will be a tendency for some reviewers and readers unfamiliar with the magazine to compare it to Jon Stewart's book America, the writing by the mental_floss brainiacs is top notch and you won't see pictures of naked supreme court justices in this one (thank goodness). Humorous and all-encompassing from the discussion of early "aboriginal beliefs [which] have been credited as forerunners of modern ecological science," (p. 14) to documenting the Pope's decision to start sending out text messages, no group or time period is left unexplored. Helping to break up the text, they even provide sidebars filled with odd facts including one that states that carrying brides over the threshold and having a best man at a wedding "probably date from the third-century practice of Germanic men abducting brides from neighboring villages and carrying them home, with the aide of a loyal companion," (p. 111). Offering "A Cheat Sheet" for the Enlightenment and breaking down the major who's who of certain important periods or "Four Goofy Things About the Crusades" or "In Case You Haven't Heard of that 'Renaissance Thing,'" they lead into each topic with a welcoming friendly and humorous vibe and one is never sure where the authors will take you next. Whether it's chronicling the earliest headache cure which involved a practice called "trepanning" as a hole was bored into one's skull (p. 28) to discussing that Spartan women's ownership of roughly "forty percent... of the agricultural land... [made] them far more 'liberated' than other Greek women," in their accumulation of "property and power" (p.41), you're almost guaranteed to learn something new or at least discover it in a way you wouldn't expect with every turn of the page. While those familiar with the magazine know that because mental_floss writers and editors cram so much knowledge into each and every page, it's not exactly a periodical you can speed through quickly, the book is far more dense and careful attention should be paid to ensure you're absorbing the information. However, thankfully we're not quizzed on everything as in the magazine but in the same token, I did wish for an index (which may be included in the official version and wasn't available for my "review copy"). A must-own book that I think history buffs and especially those who continually fall asleep with their heavy textbooks dropping onto their chests will want to be sure to pick up. A great and far friendlier way to "feel smart again," while laughing yourself silly in the process in learning about the Russian origins of fast food, Iceland's "grandmother of parliaments," or carnivals that charged "a penny for a minute's worth of intoxication by laughing gas," mental_floss is sure to provide more than enough fodder for the trivia fan in all of us. Hitting the shelves of your local bookstore (or via Amazon below) on Tuesday, October 28th from Harper Collins, the global history as told by the men of mental_floss proves their belief that "just because it's true doesn't mean it's boring" indeed.